Coordinator on a contract basis in China. Three and a half years into the job, the company suffered major losses and went into restructuring. He was part of the mass retrenchment and eventually returned home. At a loss upon his return to Singapore, he just helped out with his family’s private bus business as at bus driver. His passion for the maritime industry was fuelled during his work stint in China, having to work with Captains and vessels. With the technical capabilities acquired from his previous job, he was attracted to the TETA programme structure and the opportunities to learn from the pioneers in the industry. 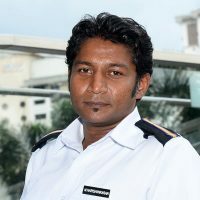 With TETA training, Harishankaran is confident of achieving his passionate aim of a seafaring career. Knowing that experience is always gold, he hopes to learn more from the experienced pioneer seafarers. He aspires to be a well-rounded Chief Engineer one day.